Michael David Bishop was born on November 5th 1958 in Santa Maria, California. The six foot two right hand hitting catcher, was drafted out of high school in the 12th round of the 1976 amateur draft by the California Angels. He showed some power in the minors hitting 28 HRs or better between two leagues in both 1979 & 1980. 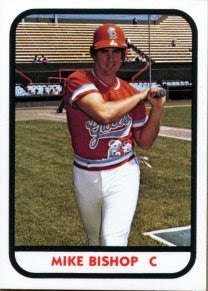 In 1980 he led the Texas League with 33 HRs & 104 RBIs while playing at AA El Paso. That same year he got to AAA Salt Lake City & followed with a full season there in 1981, hitting 15 HRs with 91 RBIs. In 1982 he hit .267 with 12 HRs & 49 RBIs at AAA Spokane but was granted free agency at the end of the season. 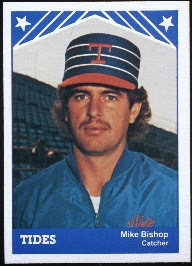 In December of 1982 he signed with the New York Mets organization. The Mets were in quick need of a catcher & brought him right up to the club. He made his MLB debut on April 16th, 1982 at Busch Stadium, catching Ed Lynch. He struck out twice in the 6-2 Mets loss to the Cardinals. On April 20th, he got another start in the second game of a double header. Tom Seaver threw a 6-0 shut out in the first game. In the second game, Bishop got his first hit, a double off Pittsburgh's Lee Tunnell. He was at bat with the bases loaded in the 5th inning, against Pirates pitcher; Rod Scurry. Scurry threw a wild pitch with Bishop at bat & Mookie Wilson scored from third base. Bishop then walked to load them up again. The Mets won this one 7-5 at Shea. Bishop played in just one more game before getting sent back down. Veteran Ron Hodges (96 games) would see most of the catching action that year, his last season. Junior Ortiz, Mike Fitzgerald & Ronn Reynolds all played behind him for the sixth place Mets (66-94). He played most of the year at AA Jackson & hit .280 with 13 HRs 43 RBIs in 66 games. His HRs were second to John Gibbons & Kevin Mitchell. He was promoted to AAA Tidewater where in 27 games he batted just .203 with one HR & 11 RBIs. Passing: It seems an injury ended his career at that point because he never played minor league or major league baseball again. Sadly, Bishop passed away in 2005 at Bakersfield, California at age 46.